Prayers mean a lot to a devotee. Spontaneous prayers spring from the heart and are often the ones which get answered in the most wonderful way. Such an experience is very personal to the devotee and is difficult to share with others. Normally prayers are said for the sick, the poor and the needy, but at times they are said for purely spiritual reasons. The latter prayers are divine in nature and enhance the love and devotional service of the devotee. Prayers sung in the holy dham during pilgrimage appear to be more spiritual than at home or at the local temple. Every year, I travel from Coventry yatra to visit Sri Mayapur Dham for the Temple Presidents' meetings, and although most of the day is spent in meetings, there are times when one can do other transcendental things. My favourite routine is the mangal arati, the tulasi prayer and japa time with all the senior and junior devotees. The sunrise of Sri Mayapur dham is truly magnificent and I always like an early morning walk to Yogapith, the birth place of Sri Caitanya Mahaprabhu. 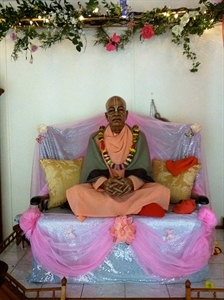 Upon entering the Yogapith temple, immediately to the right is installed a life size figure of Srila Bhaktivinod Thakura. All the visitors pay homage to His Divine Grace first. One such glorious morning, having bowed down to Srila Bhaktivinod Thakura, I raised my head to take darshaan of His Divine Grace's noble face and mumbled some wishful words. To my surprise, the white marble face started to change colour. The orange-red glow of the rising sun bathed the Acarya's countenance and filled my heart with joy. I will never forget that particular scene. Feeling satisfied, I slowly walked over and paid dandavats to the raised altar of Sri Sri Radha Madhava, Sri Caitanya Mahaprabhu standing in between Shrimati Lakshmipriya and Shrimati Vishnupriya and Sri Pancha tattva surrounding Sri Jagannath. 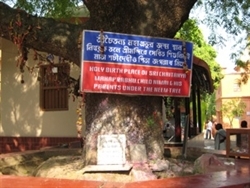 Then I eagerly hastened over to the historical nim tree under which Sri Caitanya Mahaprabhu appeared. I bowed down and took a small piece of soil from next to the tree and swallowed it. Very slowly I approached the open doorway of the cottage which houses the life size deities of Sri Jaganath Misra and glorious Sachi Matta holding Nimai proudly in her lap. I was enjoying taking darshaan of the family of the Lord where the Lord had His childhood pastimes. I recalled, how a year prior to this day, I was looking to purchase a beautiful set of Gaur-Nitai deities for installation but had failed. The devotees back in England had been disappointed. This year, I was determined to acquire the Lordships, but was also apprehensive that I might not succeed. I couldn't believe what I had just uttered. Warm tears trickled down my cheeks. My heart became contented and my mind at peace. After some time, I bowed and circumambulated the cottage and other presiding deities at the Yogapith, and started back for the huge ISKCON temple complex. Feeling happy with myself I walked towards the Gadha building to pick up a few things from my room and on the way I met an old friend of mine from England talking to another devotee from Israel. I was introduced to this devotee whose name was Ishvara Krishna Das. Somehow the topic of deities came up and I revealed to them that I was looking for a set. Ishvara Krishna enquired what type of deities I was looking for. I said that I was looking for eighteen inch brass deities of Gaura-Nitai with beautiful round faces and open raised hands with a dancing pose. He smiled and asked me if I would like to receive one such set. I enquired if he was into selling deities. 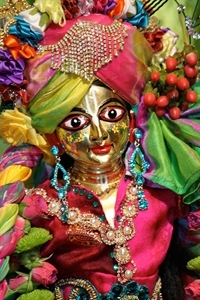 He shook his head and explained that years ago he was donated a set of Gaur-Nitai deities for installation in Israel. Some of the Gaur-Nitai deities of Russia were modelled on these. Unfortunately, circumstances did not allow the installation and They had been lying sleeping in Their trunks for five years. He added that prior to coming to Mayapur, he prayed to Gaur-Nitai to find someone who will take the deities to install Them for opulent worship. No sooner had he spoken his story than my friend from England endorsed that Coventry Yatra would be perfect for his deities. Realising my good fortune, I told them about my morning prayer to Sachi matta, which I felt had lead to this encounter. Ishvara Krishna also felt that his prayers had been answered. We embraced each other with happiness. However, nothing is so straightforward. Ishvara Krishna had to ask permission from the Israeli authorities whether he could donate these deities. Suddenly from a joyful mood I became anxious. Both of us started to traverse the Temple complex looking for various people who would sanction this gift. In the beginning their approval proved difficult. They did not know me or the yatra. Then I spoke to my Gurumaharaj, H H Krishna Das Maharaj and I pleaded with him to intervene. Mercifully His Holiness did just that. I assured them that I would pay for the deities and for the shipping charges from Israel to England. I was told that the deities would be a donation but perhaps I should pay for the carriage. 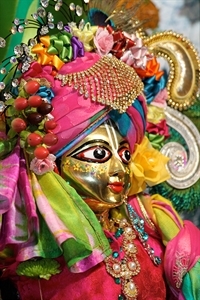 It was agreed late that night, prior to my departure from Mayapur, that I could have the deities. I was elated. The question was, when would I physically get them in my hands. The day I returned to Coventry empty handed, my dharampatni, Prem manjari Devi Dasi, informed me that Vidur Das, the vice T.P. had made an appeal and collected thousands of pounds for the installation ceremony. They were anticipating that I must have purchased the deities this year. No-one here knew about my exciting experience. Everything depended on the Israeli devotees keeping their promise. I was anxious. That night I had to go to bed early as I had a migraine attack and I could not visit the temple. In one sense it saved me from telling them that I had returned empty handed. Next day, at six in the morning, the phone rang and a devotee introduced himself as Japa Yagya Das. He said that he was speaking from Gatwick Airport and that he had some deities for me. Half asleep, still suffering from jet lag, I said "Which deities?" I could not believe it when he said that They were the deities from Israel. The penny dropped. Suddenly I lost all my sleepiness and enquired further. He told me that the coach from Gatwick would pass through Coventry that morning and asked me to meet him. "Of course! ", I replied. I had been to Coventry Coach station before but never to receive the Lord Himself. My dharampatni had cooked prasad for Japa yagya Das and his dharampatni. After a short wait the coach pulled in. Japa yagya had not seen me before, but as soon as he saw my beaming face, he said, ` Are you Hari Das?' I handed over the prasad bag and he took me to the boot of the coach and placed in my eager hands two relatively heavy trunks. I was delighted. The coach drove off on its way to Ireland leaving Their Lordships in our care. I placed the trunks carefully on the floor of my sitting room and slowly opened the lid. I hoped the deities would be beautiful. It was too late to wonder now. Two elegantly raised hands, painted red, reached out of the trunk. My moistened eyes greeted a beautiful round smiling blindfolded face which rested calmly on the packing cloth. A simple cloth was wrapped around the torso and the lower parts of the body. The first darshan sent shivers down my spine. I quickly opened the second box to find another beautiful form with extended arms similarly calling, as if to say, "We are home!" 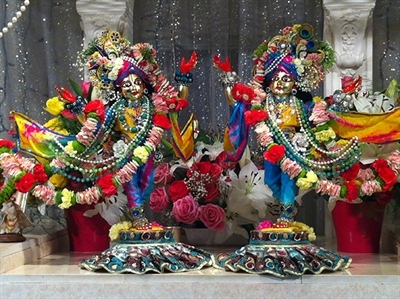 Coventry Yatra became the third ISKCON temple in England to have installed deities. There are over 30 initiated devotees serving Sri Sri Sachinandana and Nitaicand in a very opulent way. Household devotees take turns to sleep at the temple each night and wake the Lordships for mangal aarti. Fresh garlands are offered each day. The Lordships have over forty sets of most opulent dresses and several backdrops. They are the heart and soul of the Yatra. They were installed in 1994 by His Holiness Krishna Das Maharaj and H H Sivarama Maharaj. As a Temple President, I feel that the success of Coventry is due to the mercy of many personalities including Srila Prabhupada, H H Krishna Das Maharaj, H H Sivarama Maharaj and all our other well-wishers. However, there is one personality who I will be always indebted to, someone in Yogapith, who lovingly carries young Nimai in her lap, and blesses those who seek the shelter of her young Son. I thank Sachima for answering my prayers, and giving us her Gaura Hari. We call Him Sri Sachinandana and His brother Sri Nitaicand. Every time we take Their darshaan, our faith in the power of prayer strengthens and we feel protected.